* 4 Bonus Audio interviews (average over 1 hour long each) with 4 independent newsletter publishers. The way these interviews were structured allows you to get maximum value out of them, and here’s why: The interviews were set up like a Q & A from both sides. So, on the one hand… the publishers were asking me questions they had, about things to do to improve some aspect of their newsletter, or to reduce the time it takes them to put it together. And at the same time, I was asking them about particular things they’ve done in their newsletter, and how it led to the incredible results they were seeing. Very cool, I must admit. Oh, and by the way, 3 of these people published Free newsletters (which are the most common), and 1 published a paid for subscription model. So you’re getting a nice variety in here..
* PLUS… since I also want you to be able to market your newsletter, I’ve included 3 separate newsletter marketing swipe file examples for you, PLUS… video critiques and explanations of the sales letters themselves. 2. Instead of getting 3 videos and 3 newsletter marketing swipe file pieces, you’ll be getting 19 of them. That’s right – NINETEEN! Again, I’ve really gone out of my way to cover absolutely every single aspect of writing, publishing, and marketing your newsletter in this program. OK, that’s enough for today. Tomorrow, we launch! P.S. 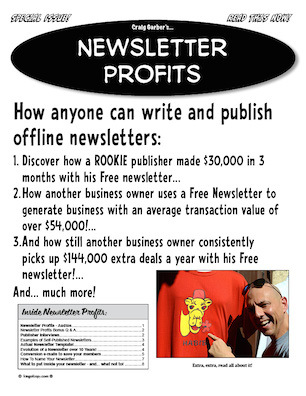 Don’t forget – Newsletter Profits comes out TOMORROW at 12 NOON, Eastern Time, and will be available for 7 days only.